Selected recent shenanigans, to be precise. And what shenanigans they have been! We pick up where we last left Queen Máxima, on the tail end of the Dutch royal couple's state visit to Italy. The King and Queen visited a soccer clinic, followed by a dinner, on day 3 of their Italian visit. Some would wear a jersey to a sportsball sort of event. Maybe a nice pair of sneakers. Our Máxima, one of a kind gem that she is, chooses to wear the net. I did say that I wanted the trip to produce a new Valentino purchase. Perhaps I should have kept my mouth shut. Day 4 of the Italian state visit. That is one distractingly gravity-defying hat, perched there like a hula hoop in mid swing. Might be that she needed a dress this busy just to balance the focus. 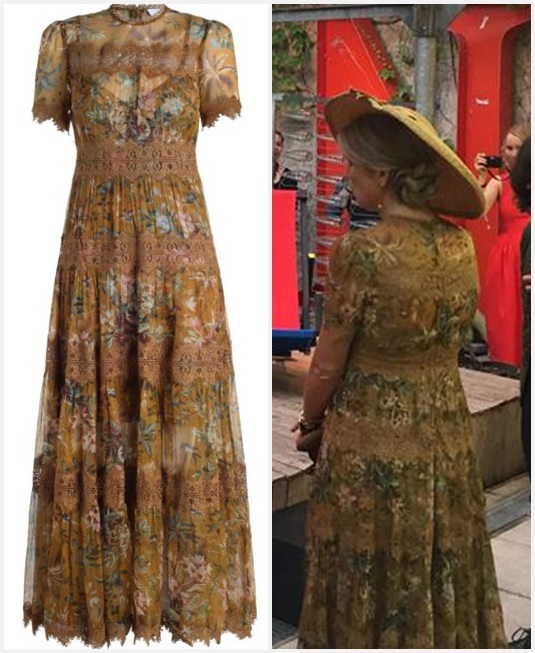 I'm giving her all the credit and then some for the dress though, because I would not have thought a "mustard floral" would look cute on anyone, and yet here we are. Back home for the opening of the European Academy of Neurology congress. 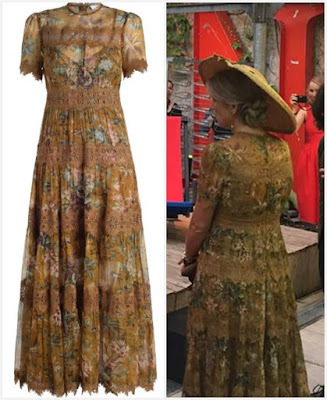 The last time she wore this, I said that adding too much of an accent takes away the delight of an accent. Now look what she's done: added yet another green accent piece in the form of a wee hat. Oh well. At least these shoes deserve a little attention. I think they're a far more interesting choice than a boring old pump, and around these parts, I can always use something more interesting than a boring old pump shoe.